Molotow Speedflow Markers feature a patented Flowmaster pump-valve that provides a continuous ink flow for quick application on large areas. 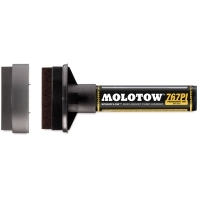 Molotow Speedflow Black Ink is alcohol-based and nitrogen-based, and has a visco-plastic coating with a light copper luster. Permanent, high-covering, UV-resistant, weather-resistant, quick-drying, and abrasion-resistant, this marker is perfect for indoor and outdoor use. Speedflow Markers are available with a large 60 mm High-Flow tip or in a pocket-sized version with a 4-8 mm chisel tip. Molotow Speedflow Ink Refill — The fuel for Molotow’s Masterpiece markers and empty markers, this alcohol-based ink is 100% buff-resistant, UV-resistant, and weatherproof. Available in Black, Speedflow Ink has a light copper shimmer and a visco-plastic coating. 250 ml safety glass bottle.